So, there’s a reason for that gravity-defying shock of hair on the top of a troll’s head. It comes in mighty handy for camouflage, swinging from place to place, or even as a weapon against the attack of a hungry spider. But these Dreamworks Trolls hate to resort to that last item. Fighting is unhappy business, and Trolls are the happiest creatures alive, filling their days with singing, dancing and hourly hug time. 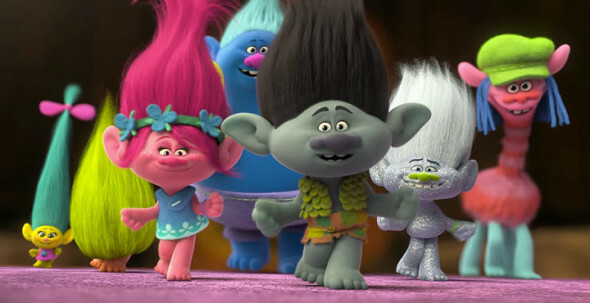 Branch (Justin Timberlake, with a speaking voice that suddenly sounds more polished) lives in his doomsday bunker and warns Princess Poppy (the always likable Anna Kendrick) that loud frivolity will one day attract the attention of the dreaded Bergens, the giant miserable ogres that get their only happiness in life from…eating happy little Trolls. Of course Branch is right, and when the evil Bergen Chef (Christine Baranski, hamming it up to fine effect) makes off with a fanny pack full of Trolls, Poppy must convince Branch to help her rescue their friends, teach the Bergens the meaning of true happiness, and get with the singing and hugging program already! Crafted by a a team of co-directors and co-writers sporting multiple animation credits including the Shrek films, Trolls ends up feeling closer to a Smurfs episode after a big-budget 3D upgrade. It’s full of constant song snippets and color splashes, with a repetitive message of plucky positivity aimed squarely at the 8 and under crowd. For the parents in tow, a few attempts at tongue-in-cheek humor do find their mark, like the friendly cloud who just wants a high five and the hippie-trippy rendition of “The Sounds of Silence.” Recognizable hits and familiar story lines keep coming, each reinforcing the vibe that Trolls is only interested in serving reheated leftovers. There’s no crime is being a perfectly passable way to spend an afternoon with some young ones. Trolls certainly fits that bill, but its formulaic tale delivers little more.